It seems I've been on a roller coaster this past 2 weeks dealing with mom's illness and dad's anger over it. 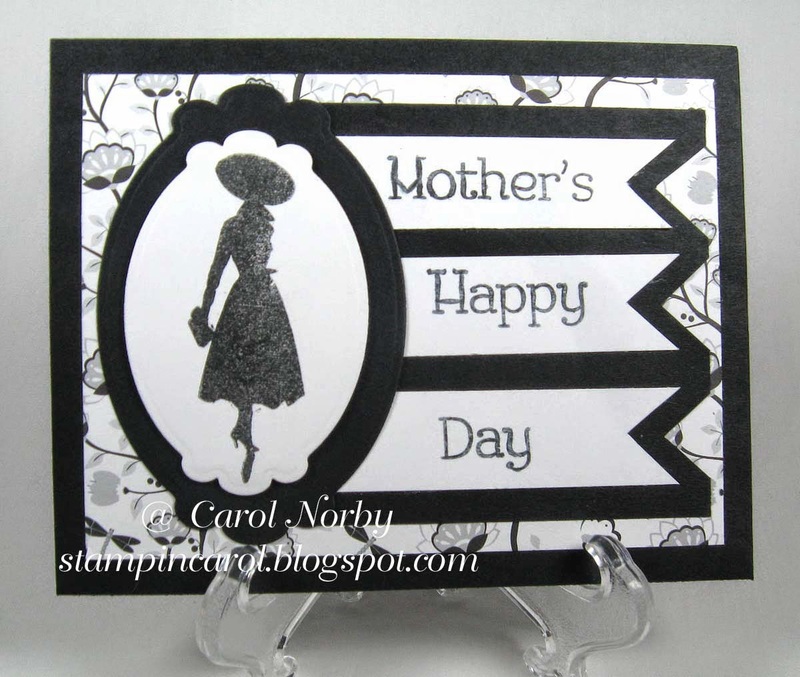 But I did take a few minutes to start on some cards for Mother's Day. 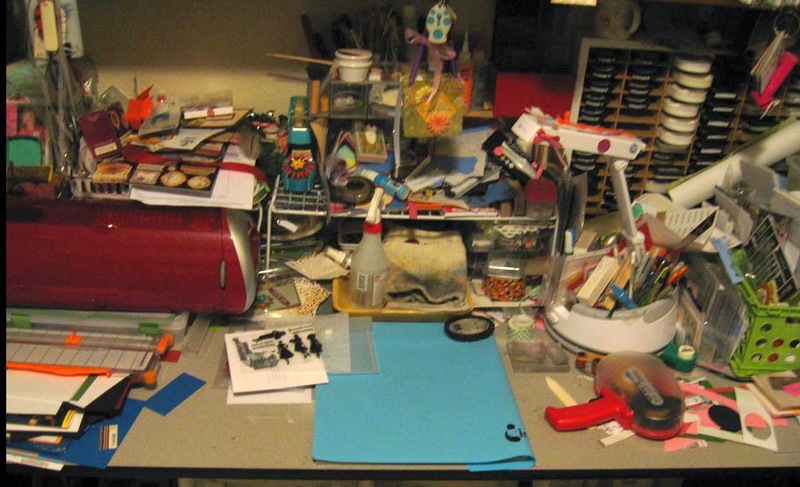 And, you know today is the day I show you my desk along with over a hundred other crafters from all over the world. Julia, at the Stamping Ground, is the head desker who brought us all together into a giant blog tour! Check out her blog when you're done here and see all the great desks and fabulous projects. But here's a look at my desk today. Not much happening. I'm giving you a larger picture of my work area and it is a disaster. But I know where things are! Let's see, left: Cricut, paper pile, trimmer, top of small shelf full of almost done projects. Center: stamps, Scor-Pal under my craft sheet, black ink pad, water sprayer & rag for cleaning stamps, shelf of LOTS of stuff. Right: OTT lamp overflowing with stuff, large ink rack, ATG tape dispenser, small paper scraps, & baskets of paper scraps. Quite a mess! I've cleaned it up a time or two then can't find stuff. Guess it'll stay like this for now. And I'll show you a couple cards I managed to complete this weekend. This card was trying a different way of doing a sketch. It wasn't until I downloaded the picture that I noticed my boo boo. I had a good laugh but will not try to fix it. Do you see it? Ok, now head over to the Stamping Ground and check out the desks. I didn't get much visiting last week as my brother arrived and we had some good family time and visited doctors to figure out the best way to go with mom's health issues. Oh I feel for you! This has happened to me so many times, I don't notice until its all done! 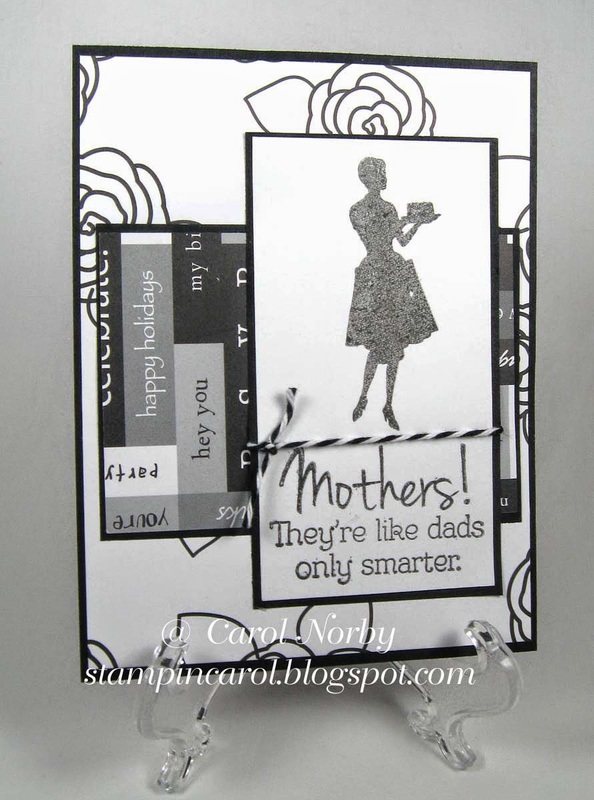 But the cards are beautiful, and "Mother's Happy Day" still works!! I just sent one out on the weekend that had my signature stamp on the back of the card upside down! "Mother's Happy Day" works, too! lol I love the sentiment on the other card. So sorry to hear all you are dealing with. I hope your dad gets past his anger so he can be a true help to his wife. Hugs to you. LOL it is a Mother's Happy Day when get taken out to lunch and gets to be with her family. I really like both cards. Keep your chin up! Raising the adults that raised you is very tough. Sending up prayers for you. I am so sorry your mum is suffering health issues as the moment, this must be a worrying time for you and your family, such a touching and special card, that black and white touch does make it look very sophisticated. Thank you for your visit, it is so nice to catch up with crafters from all over the world! Haha..love the 'mistake'..I could not let that stay, I would have to 'fix' it..that's one of my things. I would try to tell myself to leave it but I know it would get the better of me...heheh. Love the verse on the first card, that's awesome. Hope your Mum gets better....thanks for your visit to my part of the blog world. Happy WOYWW Sorry to peek in, read and dash... .!! Love the monochromatic cards. very classy! So sorry to hear about your Mom and Dad difficulties. :-( I hope your Mom improves and your father gets better with coping. LOVE the first Mother's Day card. And I had to look really closely to find the mistake. Loving the mothers day cards. I understand fully what you are going through with your parents as I have had something similar. I actually liked the sentiment better the way you created it. I bet no other mother will get one like it! And that first one is really awesome, because of the image. Thanks for stopping by my place on Wednesday. Sorry I'm late. Guess I partied too hard this week (grin). Belated WOYWW wishes from # 9.